Time recording with a data acquisition terminal. Our special terminals support the decentralised configuration of AB-WorkingTime. Data is collected on our server and is available just a short time later. Data collection on a PC thus is reduced to the input of holiday and sickness periods. Your members of staff are identified in all data procedures via an identity card with a transponder chip and no personal contact is involved. Before starting work, staff can retrieve relevant data in their working time account (plus and minus hours, for example): Every possible data collection procedure is completed by touching a maximum of two further buttons on a large illuminated TFT touch-screen. Afterwards, a clear message is displayed telling the member of staff she / he has completed the procedure successfully. New: with optional fingerprint scanner! What is special about the data acquisition terminal? Acquired data is transferred to our work schedule server via a mobile phone network. Then, you can call up data via convenient software from any PC connected to the internet. All data collected on the terminal is recorded in log books for traceability. The housing for our data acquisition terminal is of robust quality with a solid appearance. 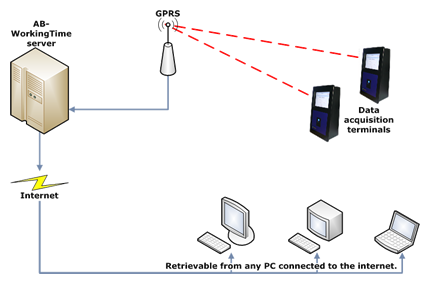 The devices can also be installed at any inconspicuous location since they work with technology that is not fixed to one location. No complex assembly or configuration is necessary because of our data acquisition terminal's mode of operation. No connection to local data networks, no cabling, no connection to a PC or printer - all you need is a plug. So, it's possible for us to offer installation at favourable flat rates and you are assured that your time recording works reliably, even after modifications to your EDP landscape.